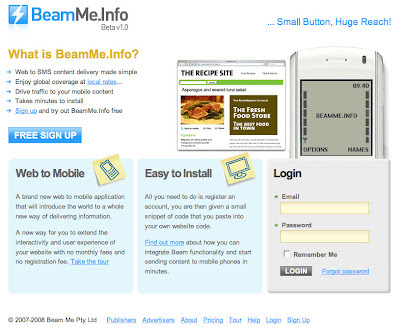 Co founded by, Alex Macpherson, Brad Down, Tim Murray, in 2007, BeamMe.Info is a web platform that allows website owners to add a Send to Mobile button alongside relevant and valuable content their visitors/users might be looking for. Perfect for desktop web users looking for promotional codes, address listings, event times and places, transport confo's, product info, etc. Rather than printing it out or writing it down, its a simple click and send function that sends the required info to your phone via SMS. Also perfect for the delivery of mobile urls to drive traffic to mobile web assets, while users are on the go. 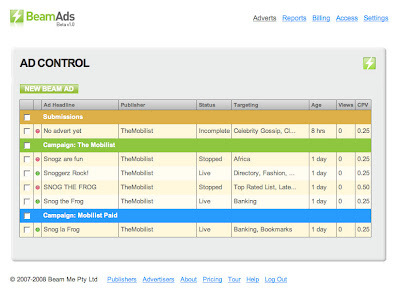 There is also a powerful ad-supported model that allows website owners to turn the SMS expense into a revenue opportunity by allowing targeting and relevant advertising messages on the bottom of their Beams. This is a compelling new channel for advertisers to open up a conversation with potential customers direct into their mobile handset alongside valued content requested moments before. Let us explore bit more about Alex, his journey as being an entrepreneur and changing landscape of innovation in Australia. To allow web users to get information to their phone, when and where they want it. BeamMe.Info takes a small clip on the cost of each SMS sent via the system. For Users the service is free, and no registration is required. For Website Owners, there are no set up or account fees, they only pay for the actual SMS usage in any given month. Or if electing for the ad-supported model, the expense is negated by the advertising proceeds. Predominantly a younger age set, but anyone who can use basic web and SMS is fine. 100 clients, 10,000 users to date. Angel, raised $0.5million AUD in Sep 0.7, Passively seeking next stage funding. In short, I love it. I don't think starting a venture here is any more or less difficult than anywhere else in the world. You are met with more or less the same risks and challenges. However Australian investors tend to be more risk averse by nature and tend not to see as much blue sky as their US counterparts. As such funding rounds and growth profiles tend to be less aggressive. • Which city in Australia is more vibrant and can be regarded as Silicon Valley of Australia? I don't think we really have a central hub of tech here in Oz. I am seeing all sorts of tech ventures coming from all our centres. Not to bad given we are a relatively small marketplace in a global context. However still some room to move and improve. • What do you think of our TAFE/Universities and their curriculum in terms of promoting and encouraging entrepreneurship and innovation? Its been a while since I studied, and although the material back then was reasonable, there was never really much of that get up and do it yourself entrepreneurial spirit. I don't think you really get inspired by the nature or quality of material in a given curriculum, moreso the person delivering the information to you, and I was not fortunate enough to encounter any of those rare lecturers or teachers that inspired me that way. • What do you think government (federal and state) should do to improve the culture of innovation? First and fore-mostly, sort out the construction of a high speed broadband network as soon as possible. • At the 2020 conference, PM Kevin Rudd is meeting with top 1000 people from different background to discuss and collaborate on the issues facing the nation. What issues would you like to raise if you are given a opportunity to attend? The single biggest issue in my mind is our approach to Global Warming and the environment. We and our leaders need to rapidly move past our 'self interest prevails' mindset and gain some traction with emissions reduction. The cost of doing nothing will be far greater than any cost we will endure now, and we need some robust, flexible and lasting leadership on making the required changes as a matter of top priority. Fasten your seatbelt! Its quite a ride. Be sure to get revenue in the door as soon as possible. Thanks Alex for sharing your thoughts. We look forward to hear from you in future on the progress of BeamMe.Info. All the best for BeamMe.Info. 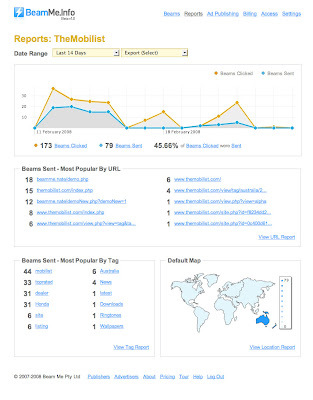 For coverage on other Australian startups/innovation/tech trends check this.